I remember Remembrance Day ceremonies as a child, not yet fully understanding a world where on occasion war was necessary and the sacrifices made were ones that had allowed the freedom I enjoyed. I remember learning my father had tried to volunteer for service during WW II, a young German-Canadian farm boy who was underage for the military and rejected due to his flat feet. I only learned of his attempt to join after his death as he never spoke of it when he was alive. I remember the first time I heard her recite the famous poem about poppies when she was in elementary school and realizing that she too was at the age where she did not yet understand the true meaning of those poppies and that day. I remember visiting London and seeing centuries old buildings pockmarked by bits of shrapnel from bombs, a stark reminder of a time when the world shivered in fear at the sound of airplanes. I remember running my hands across those buildings and watching her small white hands do the same, watching as understanding dawned in that young mind as she began to see the physical remnants of war. Instead of the usual annual Remembrance Day ceremony I find myself instead on a bus looking out over a wide snowy white expanse dotted with farm houses and small towns, each and every one of them the beneficiary of acts of sacrifice few of us can imagine and even fewer can now recall. There are no poppies in sight on the fields outside, but the poppies are vibrant and bright in my mind. 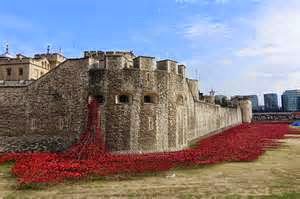 I find an image of ceramic poppies spilling out of the Tower of London, a place I visited and that resonated deeply with me in ways I have yet to fully comprehend. The expanse of red poppies ceases to be individual poppies and instead begins to resemble a sea of blood, shed to preserve freedom. At 11 am on November 11 I close my eyes and the words of a poem dance in my head, surrounded by bright red poppies flowing in waves.